Jim Stevenson speaks to fans during Monday night's meeting. 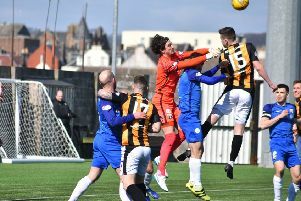 East Fife chairman Jim Stevenson is delighted to see the club still battling on three fronts this season. The Methil side have recorded some terrific results throughout the campaign which have led to them being two points from second in League One with a game in hand, into the sem-finals of the Irn-Bru Cup and the last 16 of the Scottish Cup. Of course, they were given a helping hand through to the semis of the lower league competition with Bohemians pulling out on Monday afternoon. After the news was confirmed, Mr Stevenson said: “We all enjoyed the hospitality shown by our new friends at the weekend but were disappointed that we could not get the game played. Bohemians entered discussions with the SPFL, organisers of the Irn-Bru Cup, in the days following the late postponement of the quarter final tie in Dublin. The outcome was a decision to stand down from the tournament to focus on their own league campaign.